I’ve been to hell and back on more than one occasion. I’ve felt the warmth of the devil's fingers as he reached out his hand to stroke my face. In fact, I’ve been there enough times that I’ve discovered several different escape routes- none of which allowed me to flee unscathed. I’ve managed to turn, and run as fast as I can toward the sun all the while trying not to look back. And while I’ve managed to make it out with my heart somewhat intact, my journeys from the home of darkness and despair have not been easy. My blood and tears have lined the trails I’ve crawled upon, and the scrapes and bruises aren’t noticeable with the human eye. But they’re here. They will always be here. I’m afraid that maybe, just maybe, I might never find my true love. And that notion is something that truly scares me to death. But I know in this heart of mine, this broken, battle-tested, glorious heart, that if I’m not willing to take a chance then I have fought all these battles for naught. And to not try- to not believe in true love, would be the most horrible defeat of all. I used to feel this way when I was younger. I'm not new agey or anything but I read Marianne Williamson's "A return to Love" . The bottom line of the book is that you need to cast aside fear based emotions and embrace love based emotions. I was reading it while I was dating my husband and once my perception changed, our relationship changed from bad to good and we have been happily married for over 17 years. you can do it vodkamom i know you can!!! Take it slow, Vodka.If he's the right one, there won't be any rush. However..since my word verification was "quaco," maybe you should ignore my advice! VM, I hope you embrace the feelings as they come and see where it goes. Why are you scared of that Vodka? I understand being scared of not finding him, of not being able to take chances, of the fact that he might turn out different than what you thought he was. I understand the fear of losing him once you find him, and of being alone. I understand many fears, but the fear of finding a true love, hmm. Why fear that? Oh Lord, do I have to come back there and babysit you and make sure you're not kissing frogs?! Vodka, please, PLEASE tell us you didn't write this after meeting up with Clint. I have such high hopes for your true love being the one from so long ago. Risking yourself... trusting... opening up again... it's scary, I know. I think in time I'll be brave enough to take the risk. I hope you find that you are too. Jump on every real opportunity that comes your way . . . just be smart enough to leave an escape hatch open if it doesn't work out. Oh, but the best is yet to come. I loved the post. You are a fabulous writer who can take what's in her heart and express it. Amazing! All you could do is BELIEVE! I second to Ann, you really show your talent on writing. It's amazing! I really impressed of how you write like that.Actually, i'm aspiring writer. There are so many things I love about reading your blog... this wasn't one of them. How 'bout trusting that the meaning of life isn't to find someone else...but yourself? Living singly isn't the same as living alone. Certainly stay open to love and possibilities but allow yourself to recognize that there are so many more wonderful things the world has to offer than some elusive partner! Now THAT does it. This year after that wonderful parade in our quaint little hometown we will ride a roller coaster. It will be a small version of a roller coaster, piece of cake. Then we will have vodka. Plenty of vodka. Absolutely! You HAVE TO believe in good things coming your way. Because if you don't, then they won't. I've learned that you can always handle whatever comes your way - so if disappointment is a possibility, then you can just deal with it when you have to. In the meantime, expect more for yourself. That act, in and of itself will give far more power to the possibility of good things happening. I believe in this 100% - just like I believe in you. I have just one little ol' piece of advice for one so knowledgeable and strong: When you get the chance, jump. And don't look back! Oh :( I'm sorry to hear Clint didn't turn out to be the one. We love a good love story and we were hoping you had a good one to tell. Eh well... 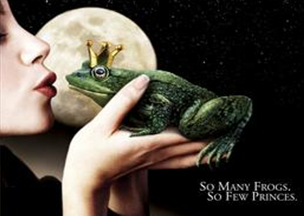 I guess you have to kiss a few frogs first, right? Big sigh-- I'm a firm believer that when you least expect it your Prince will arrive and your heart will sing. Mine did and yours will too. PS I love, love, love the Frank pic. What a guy!